The cottage stands on the sunny bank of the picturesque East Lyn river at Rockford in the lovely Brendon Valley of Lorna Doone fame. Situated on National Trust land of the beautiful Watersmeet Estate, Rockford Lodge is approached by a footbridge and is peacefully set in a woodland away from all traffic. The spectacular coast of North Devon is nearby with Lynton and Lynmouth just four miles away. From the garden gate river, moorland and coastal walks abound and the surrounding countryside is a delight for the naturalist, country lover and photographer. Salmon and trout fishing is available on the East Lyn and there is excellent riding nearby. The cottage has 3 comfortable sized bedrooms, 2 twin and 1 double a large bathroom with separate shower plus an additional loo. Downstairs there is ample living space. In the sitting room is an open fire for the colder months plus there is a large dining/TV room. The farmhouse kitchen has a breakfast table and is kept beautifully warm from the AGA. There is also a stunning River Room overlooking the East Lyn River, the perfect place to enjoy a glass of wine! There is a hillside garden with a summer house (deckchairs provided) as well as a private garden. Table and chairs plus a bbq are provided. Rockford Lodge has been a part of our family for nearly 40 years. My parents with 2 young boys and me on the way spent many years furnishing, decorating and partly restoring it so that it can be shared with others. It is wonderful now that I can go to Rockford Lodge with my 3 children, a new generation. Although my mother still regularly visits the cottage the overall running is now been passed onto me. Please do have a look at our website. The tariff and availability is always kept up-to-date. If I can be of any help then please do not hesitate to contact me. We look forward to welcoming you to Rockford Lodge in the near future. The large bathroom has a WC which has been newly refitted in 2016, washbasin, bath and separate shower cubicle. There is also a separate WC. Stair gates are stored in the bathroom for young children as the stairs are quite steep. We also provide a bed guard which is suitable for toddlers. There is a pot left next to the telephone. If used we ask you to please make a contribution. Beds are made up for your arrival with Egyptian Cotton Linen. Wood and coal aren't provided but can be bought locally. Kindling can be collected from below the cottage. Approximately 200 yds from the cottage. A wheelbarrow is provided to help you carry your luggage over the river. Access to the cottage is over a footbridge as seen in the photographs. An extremely comfortable room with a uniquely carved fireplace of two locally caught salmon - the open fire keeps this room especially welcoming during the winter months. There is a table on which to play chess or draughts. Coffee grinder and cafatiere provided. Please provide your own beans. Electric toaster provided. The AGA cooks very good toast too! The cottage is well stocked with the basics such as sugar, flour, herbs etc. and we ask if something runs out it is replaced. However there are no guarantees as to what is there. The cottage is well stocked with most items. If there is something specific that you may use such as a cake tin then we suggest you take it with you. The modern farmhouse kitchen is fitted with an oil fired Aga and electric cooker, microwave, fridge/freezer, washing machine, dishwasher, iron and ironing board. A table and chairs allow cosy, yet comfortable, additional dining. A high chair is available. The dining table has pull out leaves so that it can be extended. We have an extensive library at Rockford Lodge. Lots of children's games and books provided as well as games for grown ups and lots of puzzles. There is a selection of toys for children. Nearest golf course in located just outside Ilfracombe about a 30 minute drive away. We have had a great stay at this beautiful, very cosy and well laid out cottage. It has everything you need to enjoy your stay in this magic part of the world. Owner very responsive and ensures everything is in good condition. Ideal cottage for family with kids, who can play by the river and go on adventures in the woods. Very friendly pub on other side of river if you don't want to cook. We would love to come back. Thank you! Thank you so much for your kind words. We are so pleased you had a wonderful holiday and look forward to welcoming you back in the future. Lee Bay is a small coved beach which can be reached from Lynton and through the famous 'Valley of the Rocks'. Parking is above the beach and there is a short walk down to Lee Bay. Great for rock pooling. There is sand at low tide. A tide timetable is provided at the cottage. 10 mins from the cottage. For longer sandier beaches we would recommend Minehead and Woollacombe, 30-40 mins drive. Rockford Lodge is situated in the heart of Exmoor National Park. As you meander along the dramatic coastal road of the A39, you drop down into the valley of Brendon. One mile on, following the East Lyn river you will reach the small hamlet of Rockford. Here you will leave the car in our private car park and walk across a footbridge and down the footpath to reach the cottage. The nearest shops are at Lynton, approximately 15 minutes away. Porlock and Minehead are 20 and 30 minutes away respectively. There is a Tesco and Morrisons at Minehead. The garage on the A39 at Barbrook, south of Lynton has an adequate shop and is open during garage hours. Booking Notes: The rent includes electricity and oil. There is no VAT. The balance is due 4 weeks before holiday commences. The key box code and 'information sheet' will be sent on receipt of the balance. Deposit required is £100 per week payable on booking. £15 per day for winter bookings - up to £100.00. 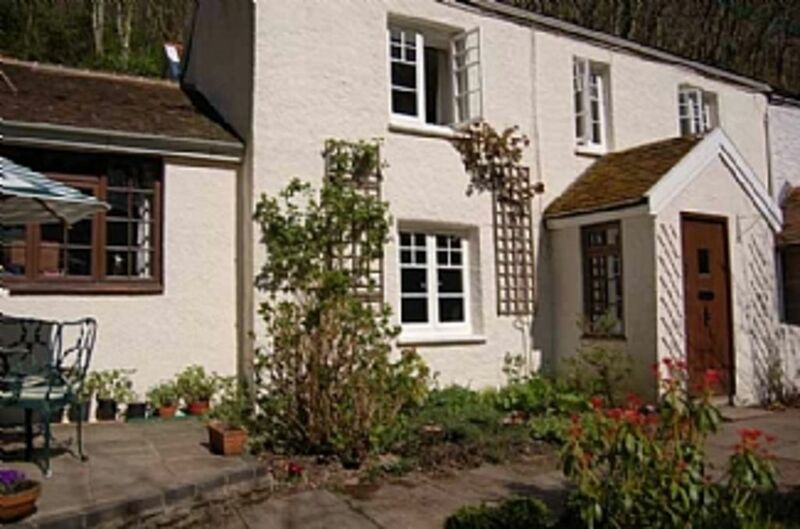 Changeover Day: Jan, Feb, March, Nov, Dec the cottage is let on a 2 night minimum. Christmas and New Year are a 5 night minimum. April through to October has a Saturday changeover. Arrival from 3pm, departure by 11am. Notes on prices: Discount: Deductions of the weekly or daily rent are given when fewer than 5 visitors stay at the cottage. 3-4 people ~ a deduction of 5%. 1-2 people ~ a deduction of 10%. Children under 3 are not included in these numbers. For 2017 the discount is not applicable between February 11-18, April 15-22, May 27 - June 3, July 22 - Sept 2, October 21-28 Christmas and New Year. For 2018 the discount is not applicable between February 10-17, May 26 - June 2 , July 21-Sept 1, Christmas and New Year.